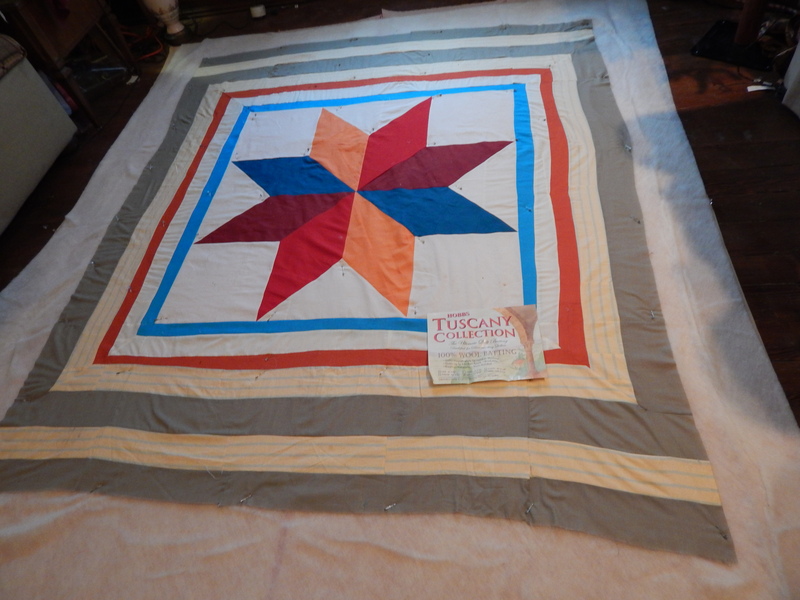 I couldn’t wait to start hand quilting the vintage star top that I just re-made ( see post here ) . Remembered a piece of fabric I had that would be perfect for the backing and I had a wool batting waiting to be used so I got it basted and ready to go. I always pin baste on the floor. I start by pinning the backing fabric to the floor (you can use masking tape but I use push-pins) . next I add the batting and smooth that out, then the top smooth again, then I add the safety pins. I do not use a huge amount of pins, they are at least a foot apart. You can see in the picture that the top is not even and square. The reason for that is that I did not re make the borders. 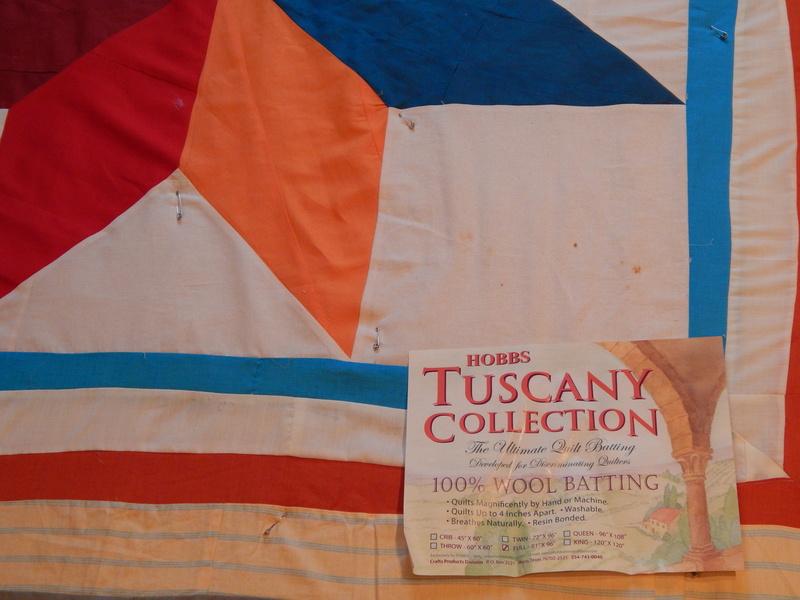 I used wool batting because it is easy to quilt but also has a good loft which will help to fill in the bumps puckers in the top. 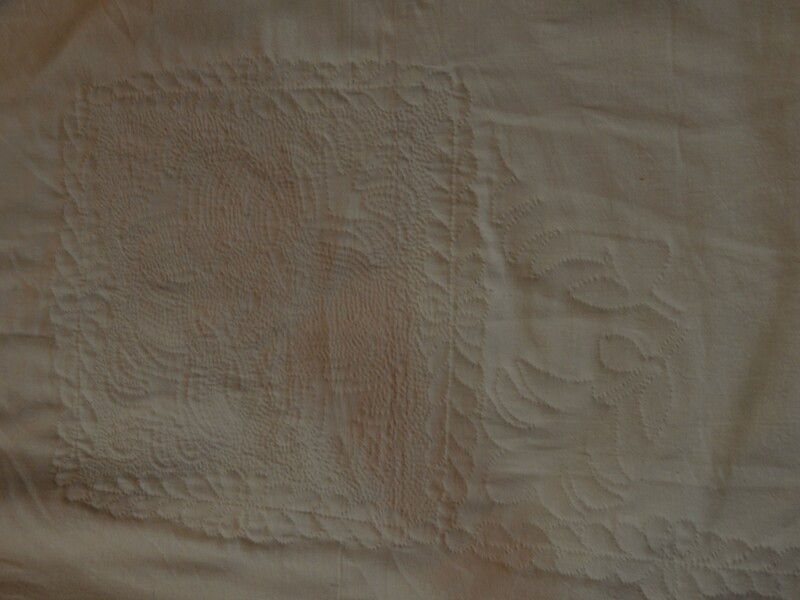 Here, folded over the corner, is the backing which I purchased a few weeks ago….I intended to use it to back a much older top but it was too dark. I think it works great with this top. It is not a color match with any of the fabrics in the top but is a good coordinating color. So I’m not going to pretend this mule is a race horse. A mule is a fine animal and this is a fine quilt. So simple it is. I used a pencil to draw the line around the bowl and then just did the inside arcs by eye. I think it is going to look just right. It adds texture and movement without being overly done. I have made some progress on the applique quilt as well. This one is a race horse ….so I want to take my time and do it justice. Both are beautiful but in different ways. 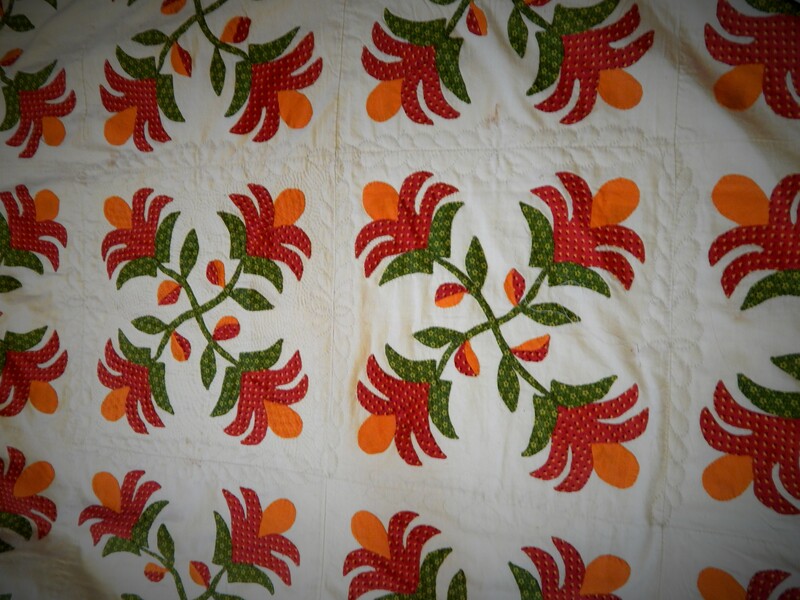 It’s so nice to see a quilting design fall into place both simple and fancy and you do both so well. 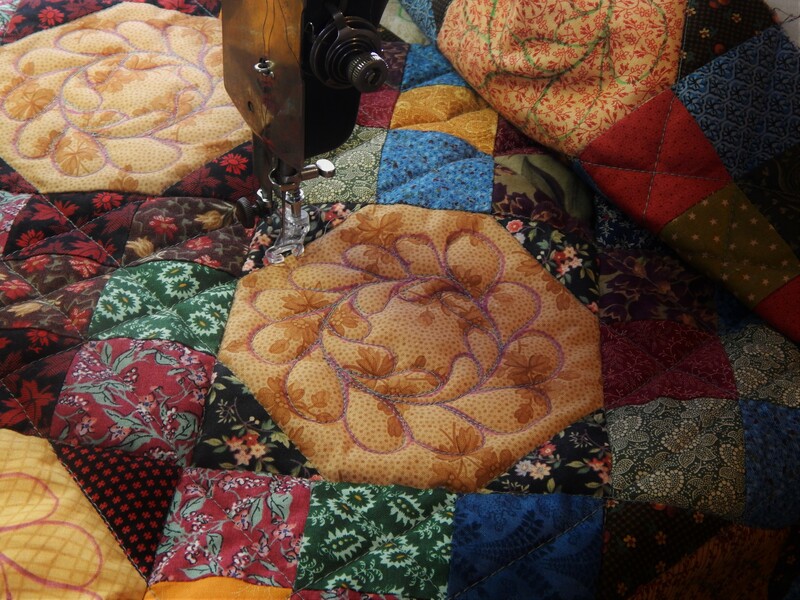 Thanks for sharing this process and the great quilt pictures. Say hello to Teddy from Washington DC. 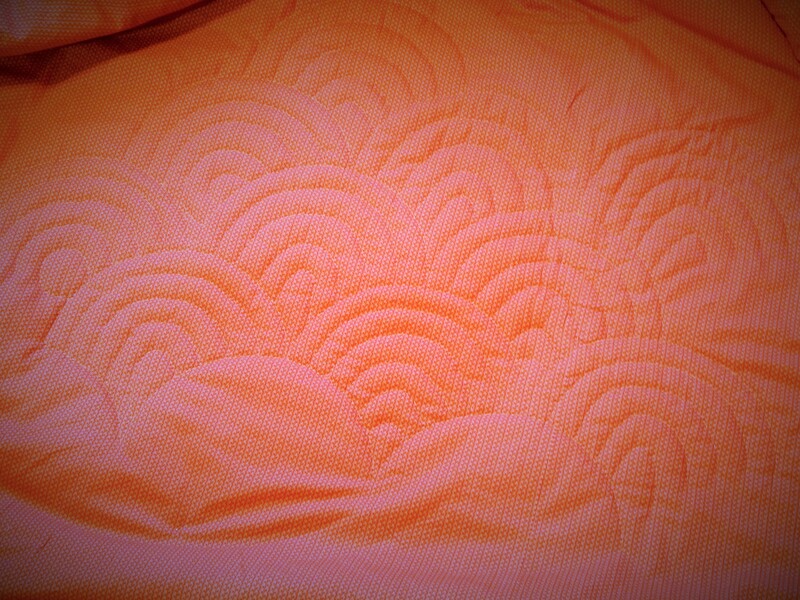 Great quilting choice. 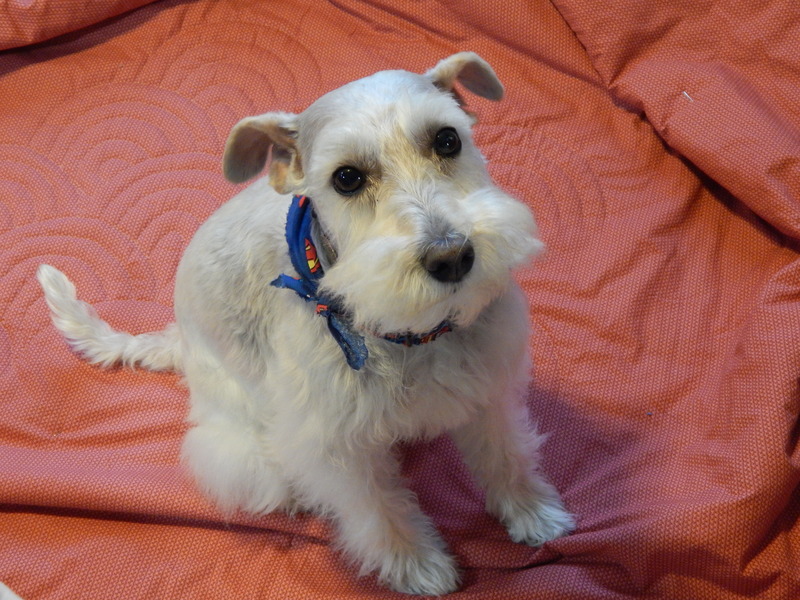 I love that you share your methods, and progress – and Teddy, of course! 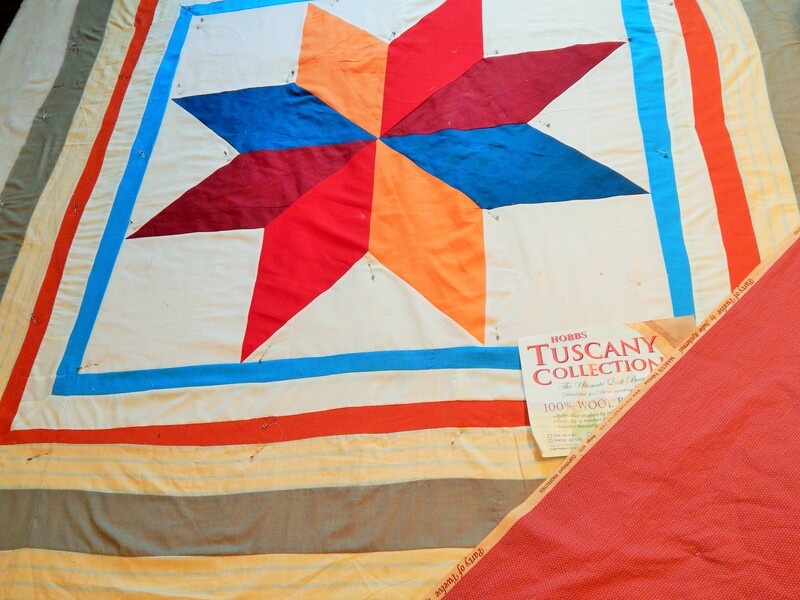 The quilting pattern your quilt told you to use is going to really *make* this quilt, Tim! Keep listening to your quilt…and checking things out with Teddy! I love the way you’re doing the baptist fan on the star quilt. I want to do that on a quilt one of these days. I love the free look of that Baptist Fan pattern. One ‘straight’ line to start you off, and then a little bit of natural wonkiness – it looks great. 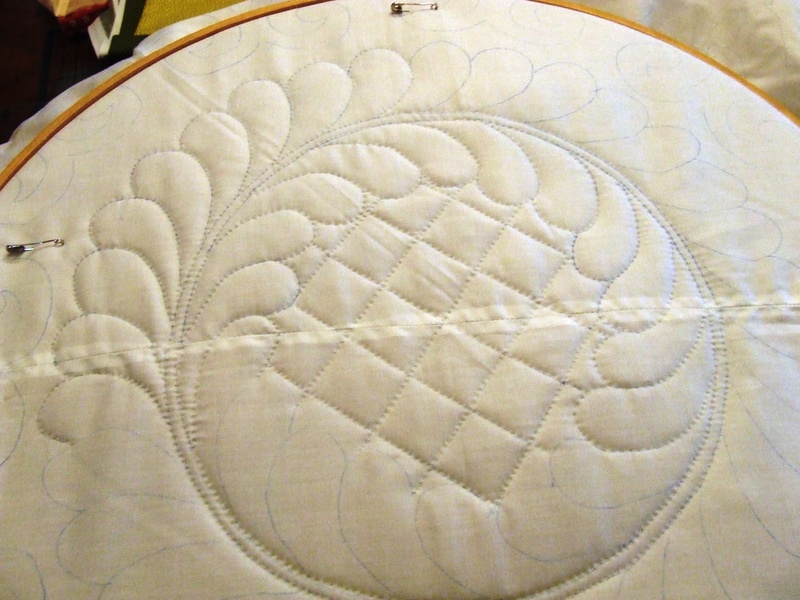 I love that quilting pattern, sort of a cross between a Baptist fan and a clamshell. 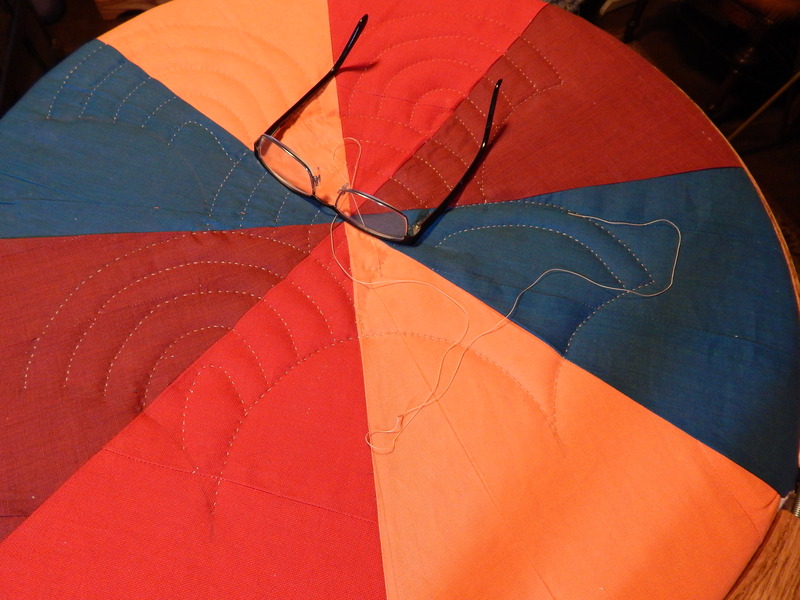 Tim, I am new to hand quilting and I am so GLAD I found your site and am now following you. Your instructions are so valuable and a great teaching tool. Thank you so much for taking the time. 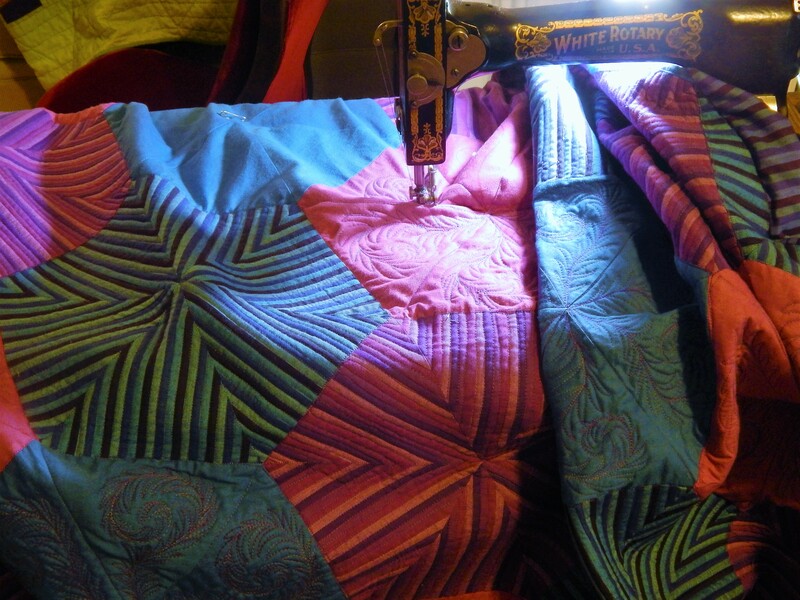 Thanks glad to have you following….and welcome to hand quilting! it is so rewarding!! 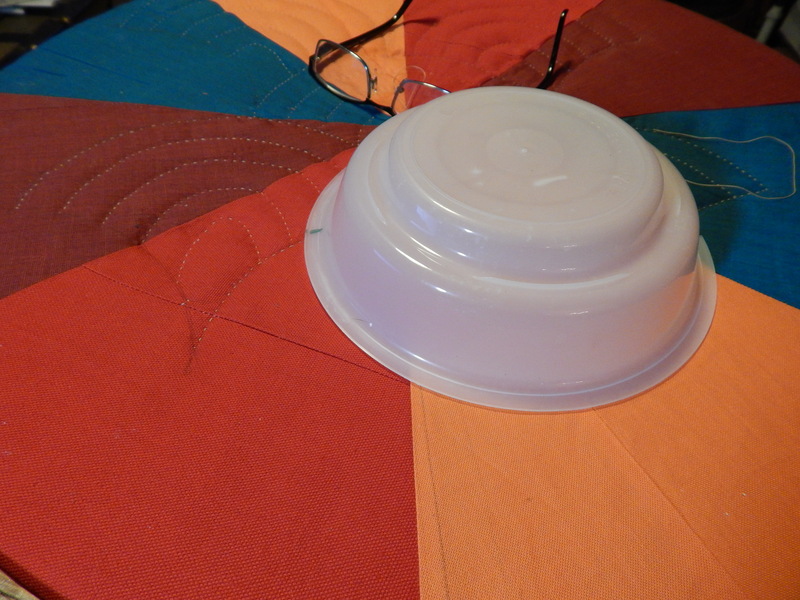 What great texture your bowl quilting adds! Both quilts are going to look fantastic! 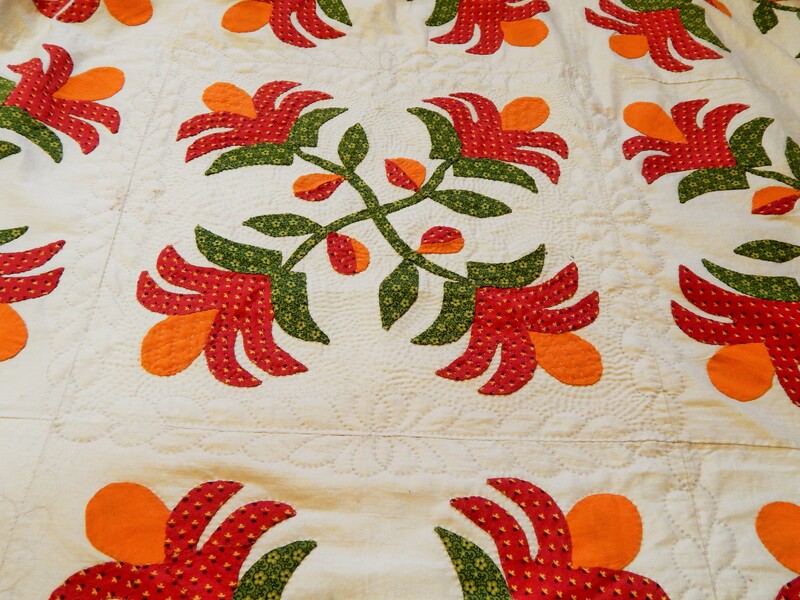 I want you to know that you inspired me to get back to my hand quilting… I so enjoyed it and also hearing about your rescued quilt tops that you so lovingly finish…you along with your blog posts are also treasures….keep inspiring us all!!! Thanks for sharing! You do amazing work!! You’re right they are both beautiful in their own right. Wow…interesting. Perhaps the seams were pressed open so were flatter than if pressed to one side, making them virtually invisible from a distance. 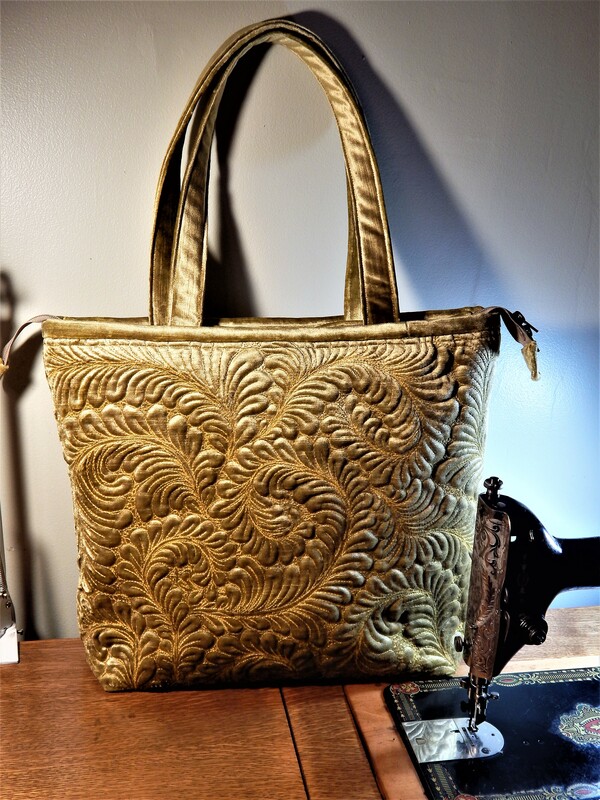 I wonder where the maker got the fabric – perhaps leftover scraps from another project, necessitating piecing to make a piece big enough for that large a diamond. Good luck at Grand Rapids next month! “Just Start” I do talk to my quilts and they do answer back. So I have that down. Thanks again. I don’t think you need to change a thing. 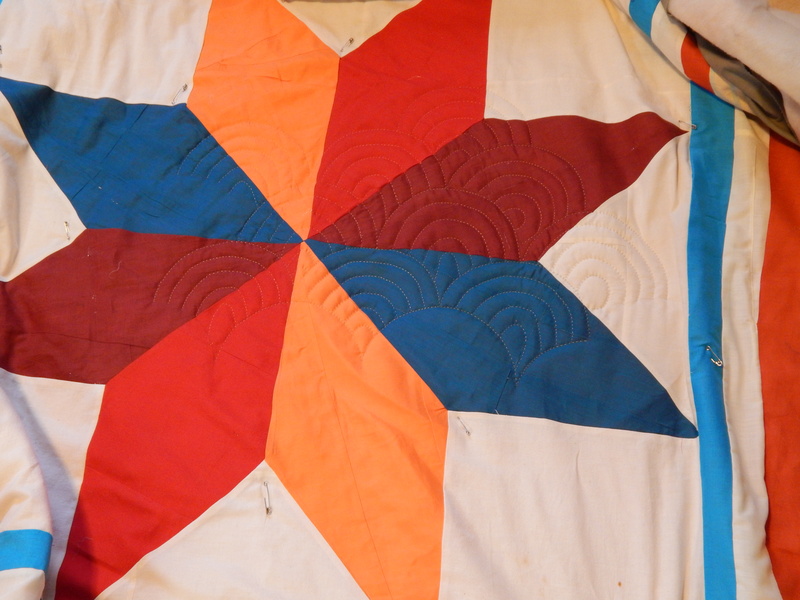 I love the quilting design on the star quilt. Simple but fitting. Tim, you simply speak Quilt. Most of us are not native Quilt speakers as you are, struggling in Quilt as a second language. The quilts tops are quite aware that you are a native speaker and favor you, don’t you think? I’ve noticed the clam shells in the Sashiko designs of Japan, along with their other designs. I can’t help commenting: I cannot believe how prolific you are, in quilting, in gardening, and in answering user comments. Extremely generous of you! I’ve started hand quilting my first quilt (queen size), and have no idea what I am doing, sort of giving it the mule/race horse treatment, but I’m enjoying every minute of it. Thank you so much for all the great information you provide on your blog. Thanks! I can relate to “no Idea what I am doing” that was how my first few quilts went ….time and practice makes all the difference…keep at it! !